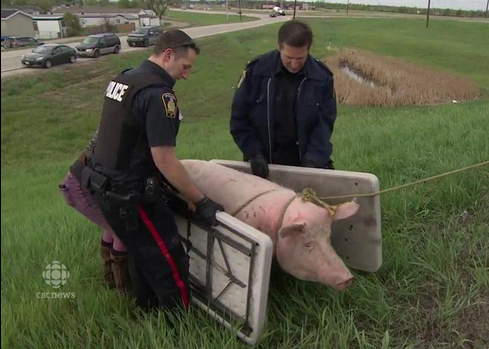 Early this morning, a sow was found walking loose on the perimeter in Winnipeg. It’s likely the sow fell off a truck from H@MS, a collecting station on the West perimeter, and was heading for slaughter in the U.S. Although culled breeding sows and boars are some of the most health compromised of all farmed animals because of their lifetime of intensive confinement in barren metal and concrete crates, they are transported the furthest for slaughter, often going from farm to multiple collecting stations before arriving at the slaughterhouse. This was very likely the first time the sow had experienced grass and fresh air. Although a number of concerned citizens and we ourselves contacted the Winnipeg Police and Manitoba Pork Council, neither would release the sow to us as she is effectively the property of the Manitoba Pork Council. 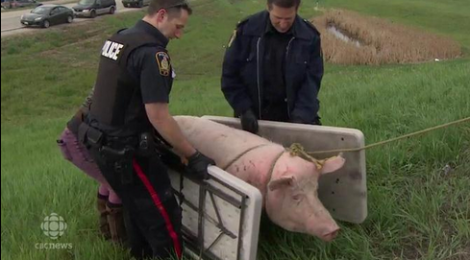 This sow’s freedom was all too brief but we were heartened to see the public response and the efforts to release her.